Moreover, we should work to make sure that the black history that Japan already has is common knowledge. For example, many Japanese have likely heard of the first black samurai, a gentleman who went by the name Yasuke, but how many people here know that possibly the first African-American to step foot in this country arrived in 1845? Eight years before Commodore Matthew Perry sailed into Tokyo Bay, Pyrrhus Concer, a former slave, came to Japan from New York. He even assisted in the rescue of some shipwrecked Japanese sailors and helped return them home. Sounds like the makings of a fascinating drama to me, someone get me Netflix’s phone number! Also, I’m sure that many people probably know that Martin Luther King Jr.’s birthday is celebrated in Hiroshima in honor of his stance on nuclear disarmament, but how many know that Malcolm X befriended a Japanese-American activist named Yuri Kochiyama? The Nebraska-born civil rights hero then attended a meeting, at Kochiyama’s behest, with a delegation of hibakusha (atomic bomb survivors) from the Hiroshima-Nagasaki World Peace Study Mission. At that meeting he told them: “You have been scarred by the atom bomb … we have also been scarred. The bomb that hit us was racism.” I wonder if that exchange has made it into any Japanese textbooks? Malcolm X hoped, as many of us still hope, to establish that black people and the Japanese should be allies due to our common history of oppression at the hands of white supremacists in the hopes we would have many other things in common. Somewhere along the line, we’ve lost sight of that. There’s so much more the black community can and should be doing, particularly those of us who’ve chosen to make homes, raise families and build lives here. I’d even go so far as to say it’s our obligation to publicly celebrate our history here. I’m not just talking about cheering on Naomi Osaka, the first woman of black and Japanese descent to win a Grand Slam singles title. We should celebrate Darryl Wharton-Rigby, a black filmmaker who makes Japanese films; Chuck Johnson, a black stuntman who forged his own respected stunt team here; or how about Oussouby Sacko, who hails from Mali and rose through the ranks of academia to become the first black president of a Japanese university. We should be celebrating Ariana Miyamoto, who in 2015 became the first biracial woman to wear the crown of Miss Universe Japan (perhaps blazing a trail for Priyanka Yoshikawa, a mixed-heritage Indian-Japanese to follow in 2016). Black history in Japan is being made all around us and every day. This columnist is humbly trying to do his part, too. Even though you’ve still got knuckleheads thinking blackface is suitable Halloween fare here, I have not seen an instance of blackface in Japanese media since the Masatoshi Hamada incident of Dec. 31, 2017. Have you? The problematic nature of blackface is now a matter of public discourse and on more people’s radars. Now, I’ve read that a fear of being leveled with accusations of “blackface” was behind the decision to make Osaka into a white girl for food company Nissin — which is ridiculous, I know — so clearly there’s still a lot of work to be done on the education front. That’s where our community comes in, every single conversation makes a difference. I have every confidence that one day Japan will no longer question whether black is beautiful. At the very least, people in Japan are thinking about the harm blackface causes and media companies are trying to encourage a discussion. 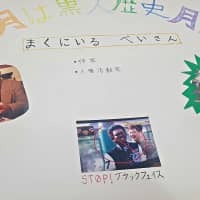 In October I was sent a link to a video presentation by a Japanese junior high school student in Ishikawa Prefecture in which she discussed the problematic nature of blackface in the Japanese media, and earlier this month I was sent a poster some elementary school students in Tokyo had put together about the wrongheadedness of the look. In those two instances I saw clear signs that a shift is taking place in Japan — and that’s something. That’s real change. In fact, it’s historical. There is no more important group of hearts and minds here than those that have yet to be corrupted. 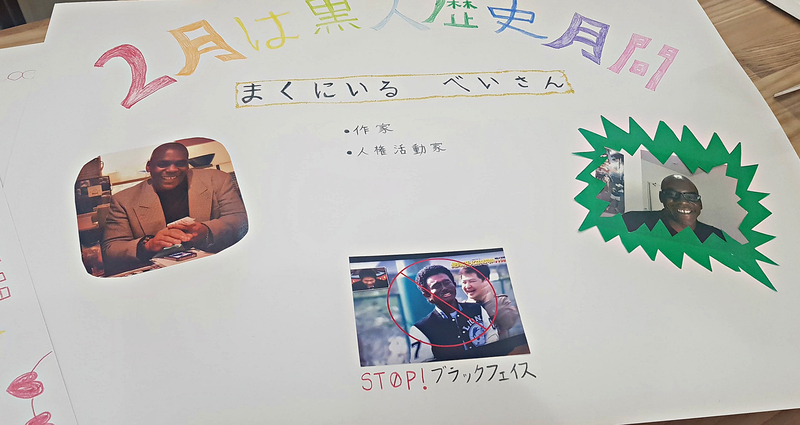 The fact that kids are learning about Black History Month means there is an effort in Japanese public schools to prepare children for a world where they’ll know how to respect all people and be able to collaborate and coexist with them on equal footing. I believe an understanding and appreciation of black contributions to Japanese society will aid in this process. So many of us here are doing such remarkable work in a variety of fields of endeavor and so, to all of you, I say keep it up! Be your excellent selves and by doing that you’ll be black history, too. Baye McNeil is the author of two books on life in Japan. For more information, visit www.bayemcneil.com.